Today we had a 10 hour travel along the beautiful Pyrenees to enter to the north of Spain for a programme in Gijón tomorrow. Being the first of May and International Workers Day it provides a good chance to make the link between Minimum Income and Minimum Wages. It is clear that without decent wages we will never have adequate Minimum Income Schemes, because the level of minimum income allowance will always have a relationaship to the level of wages. So the reversal of the destructive trend of the decreasing percentage of wealth generated, going to wages (leading to increasing numbers of ‘working poor’) has to be part of the struggle for adequate minimum income schemes. Conversely, the setting of Minimum Income at adequate levels should help to ensure we stop the race to the bottom in terms of wages. So the fight for decent wages and for adequate minimum income schemes are mutually reinforcing. In most countries and for most family types, the level of Minimum Income benefits fall far behind minimum wage levels. For instance, for a single person in the worst performing countries (BG, PL, PT, RO) the level of social assistance benefits relative to net income at minimum wage is between 21% and 36% whereas in the best performing countries (AT, CZ, DK, EE, IE, LU, NL) it is between 73% and 88%. So the argument that we can’t raise minimum income levels because it would cause disincentives to work rings quite hollow. Not to mention that people make choices of what work to do based on the prospects they see and value of the work concerned and not only on narrow economic considerations. 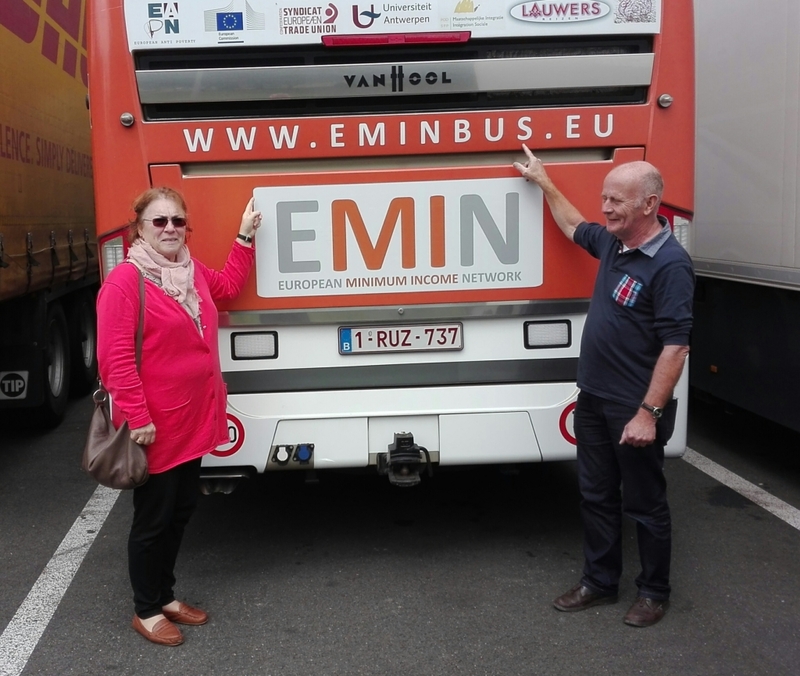 Today our volunteers, Sigird and Luc, left the bus. Much thanks, they were part of a powerful support team.